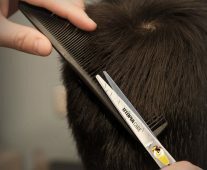 Hair management is one of the most challenging tasks everybody has to face every single day. And if your hair is too thick and frizzy then it becomes a nightmare to handle it. The most difficult part is to get your hair ready and dried in time for any urgent night out or some important event. And every time your hair dries out after a shower, it starts looking like as if there was an explosion in your head. If you are also a victim of hair management issue then we truly feel you. But, have you ever given a thought to buying a hooded hair dryer? If not, then it’s about time you did. Because that is the solution to all of your hair problems. A hooded hair dryer is not just a dryer; it is much more than that. Not only does it cut down the hair drying time to the minimum, but it also styles your hair. And above all, it makes your hair soft, shiny, and easily manageable. The below-mentioned list will help you choose the best hooded hair dryer according to your budget and hair type. If you are searching for a professional quality hooded dryer, the Conair Pro Styler bonnet hair dryer is the answer to all of your needs. This hooded dryer has all the qualities that make it perfect to be placed on the top spot. With a huge power of 1875 watts, this dryer is good enough for even the most stubborn textured hair. The hood of the dryer is big enough to accommodate even the biggest of the roller or velcro setting without any problem. The dryer features adjustable airflow settings for high level of convenience. The hood evenly diffuses air on your head, which results in quick and damage-free drying. Height issue? No problem! The height adjustment option is also there to provide maximum comfort. That’s not it; this foldable dryer is also quite portable and comes with a compact storage box. This hair dryer has all the traits of a high-end salon-like hooded hair dryer at an unbelievably affordable price. With its high power, adjustable height & heat settings, and high portability, you can never go wrong with this option. The cable may get overheated. 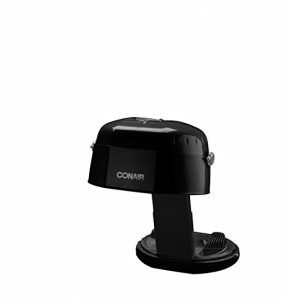 Our next pick is again from Conair but this one comes with a collapsible hood style. Like the one above, this one is also a high-quality hooded hair dryer. If you are tired of going to the salon for getting a professional level hair drying, you need to up your game by getting this baby at your place. Whether you want to simply dry your hair or you want to use it for rollers or deep conditioning, this dryer is best for every job. The head of the dryer is huge enough to comfortably fit in even the most gigantic rollers. The dual heat settings give you the freedom to choose the right amount of heat for your hair type. 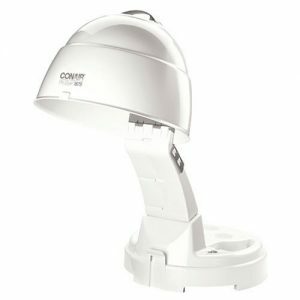 The Conair collapsible bonnet hair dryer is more or less similar to our top pick when it comes to performance and functionality. But, a slight difference in price made it take the second spot. This dryer is a perfect choice if you want professional results without going to the salon. Foldable design with a compact storage option. Ideal for using with rollers. The third spot goes to the Tourmaline tools 1059 hooded hair dryer. With a lot of happy customers worldwide, this dryer is definitely one of the bests you will find in the market. We’d strongly suggest this dryer to those of you who are searching for a superior quality professional grade hooded hair dryer. This dryer is packed with some really eye-popping features. First of all, it uses a special pre-moisture system and is also infused with tourmaline. This results in preventing your hair from drying out. This technology also helps in making your hair shiny and glossy, no matter how thick it is. The power of 1875 watts dries up your hair 50% quicker than the other models. The hood of the dryer isn’t just huge but also adjustable, which ensures maximum comfort. Just choose between the 4 heat options according to your hair type and get silky smooth hair every single time. This high-end hair dryer comes with way more features than you can imagine. In addition to its basic function of hair drying, it also improves the quality of your hair. For optimum salon like results, there is nothing better in the market than the Tourmaline Tools 1059. Two heat and four-speed settings. Keeps your hair hydrated and frizz free. Best for all kinds of hair. Adjustable hood and front visor. The plastic base feels flimsy. As evident from the name, the Gold’N Hot Elite hooded hair dryer is a premium quality dryer just like the Tourmaline 1059 above. So, it goes without saying that is costs almost double as compared to the other models featured on this list. However, you will certainly forget the price tag after seeing its excellent performance. The dryer features 4 styling settings to choose from. So, no matter how light or thick your hair is, this dryer has an option for every one of you. This hood of the dryer is adjustable, so, your height is not a matter of concern at all. 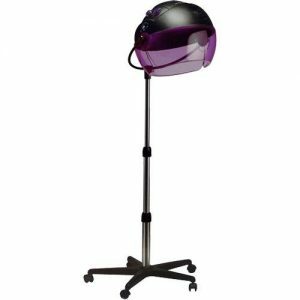 This tourmaline infused hair dryer comes with a gigantic bonnet for taking care of all of your styling needs. But, despite its huge size, the hood is quite light in weight and portable. Moreover, the removable legs of the dryer make it storage-friendly too. It also comes with an adjustable face shield and lockable wheels at the base that ensure it stays steady in its place. This premium quality dryer is loaded with features and functionality. The dryer’s 4 styling settings are more than enough to meet everybody’s requirements. And its ideal size and weight make it a perfect choice for traveling purposes too. Adjustable hood, height and face shield. Our last pick is the Pro Versa JHBD100. Like all the other models on our list, this one also features a power of 1875 Watts, which is good enough for all kinds of hair. However, do not expect salon like results from this dryer. But, for regular home use, this is an excellent choice. The dryer features four different heat settings for different kinds of hair. But, the users have reported the lowest setting to be not good enough for even the lightest hair. And the highest setting is too hot that it can badly damage your hair. So, for best results, you need to keep the setting between the two extremes. When it comes to drying time, this model is pretty good. It also has an integrated tourmaline ionizer that adds shine to your hair. This model might not be the best one out there but if used properly, you can yield great results from it. The Pro Versa JHBD100 has enough power in a small body to provide perfect results to just about any kind of hair. It also provides a quick drying experience while adding shine to your hair. Hood’s height can’t be adjusted. Doesn’t work that well on the lowest setting. Like any other styling product, you are going to find plenty of choices in hooded hair dryers too. Which might drive you totally nuts. And if you are not well prepared enough, it will be even more difficult for you to pick the right one for you. The proper way to buy anything is to educate oneself first regarding the product. In this case, you need to be completely aware of the different types of a hooded dryer and all of its other important aspects like size, power, etc. And needless to say, you have to consider your own preferences and limitations as well. For example, what qualities and features are you looking for and how much are you willing to pay for those. 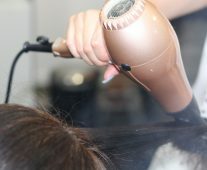 You also need to know which styles of hooded hair dryers are in these days and which styles have gone totally obsolete. And likewise, which manufacturers are more renowned and esteemed and have a good name in hair styling products and vice versa. Of course, you can’t figure that all out on your own. That is why; we are providing you here a comprehensive buying guide that covers all of the important factors involved in the purchasing of a hooded hair dryer. So, scroll ahead and keep reading. First of all, let’s take a look at the types of hooded hair dryers. Hooded hair dryers generally have two different types, first are the ones with a hard hood and second ones are those with a soft hood. Among these, the hard hooded hair dryers are further classified into two different categories. As the name suggests, the hard hooded hair dryers are the ones that have hard and solid bonnets and you have to sit under them for getting your hair dried. And as we mentioned above, this type further has two different styles. The foldable hard hooded hair dryers usually cost less and can easily fit into just about anyone’s budget. You will find these hair dryers for as low as $35. And even at the maximum side, you can get the premium ones at a price of $100. As evident from the name, these hair dryers can be folded, which makes them portable and easy to store. However, these are not as handy as the soft hooded hair dryers. But, performance wise, these hair dryers are pretty excellent. The second type in this category contains the dryers that come with an adjustable stand. These are a bit on the pricier side. But, since you can adjust the hood, their results are far more superior to any other kind of the hooded hair dryer out there. However, this type also has its negative sides. For example, these dryers are slightly heavier than the soft hood ones. Which is why they are semi-portable. But, if your whole concern is performance, then these are absolutely the best. 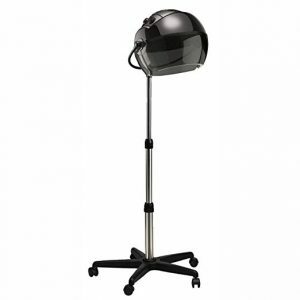 For the same reason, the majority of the salons prefer using this type of hooded hair dryers. So, if you also want it for your salon, or if you just want salon like results at the comfort of your own home, then this kind of dryer would be an excellent choice. The soft hooded hair dryers are also considered vintage style hair dryers because they used to be pretty famous in the old times. And hard hooded ones weren’t really a thing back then. The soft hooded hair dryers easily wrap around your head and completely cover it. They usually have flexible edges that keep the hood firm at its place. This type of hair dryers cost the least in comparison to all other types. The biggest benefit of these dryers is their high portability and ease of storage. Also, being inexpensive, they don’t put too much burden on your pocket. However, when it comes to performance, this type is not even close to the above two. So, we’d strongly recommend that you go for hard hooded hair dryers only, unless your budget doesn’t allow you so. The below-mentioned aspects will help you easily determine the type of hooded hair dryer that is best tailored to your needs. First of all, your head must be clear on the type of hooded hair dryer that you need. As you just read above, we have discussed both the types in detail. However, we have only included hard hooded hair dryers in our list because of their extraordinary results and salon like performances. So, we’d strongly suggest you only for the hard hooded ones. Otherwise, it’s just the same as getting any conventional hair dryer with mediocre results. Second major consideration is the total budget you have set for this particular purchase. Do not put it off for later on and decide this beforehand. You will find a wide price range for these hair dryers from lowest to highest. The quality, obviously, is heavily influenced by the price. But, it doesn’t mean that low priced ones can’t do any good. Choose yours while staying in your budget and just make sure it has enough power that you need and is good in its basic function. Just like price, the power of the hooded hair dryers also varies from one model to the other. The hooded hair dryers come with a minimum of 800W of power and go all the way up to 2000W and more. For salon like results, you need to have a dryer with more than 1600W of power. Rest, you can adjust your heat settings according to your hair. There are multiple heat settings on a hair dryer. If you know how much heat works for you then it is great! But, if it’s going to be your first time using a hooded hair dryer, we’d suggest you keep the heat setting on minimum initially. By keeping the heat least intense, you will minimize the risk of damaging and breaking your hair. But, of course, this is only possible if your hair is not very thick and can be easily dried on a low setting. Otherwise, you should keep the heat on the medium level. Use the high heat in only extreme case of need or extreme urgency. Because using it on a regular basis will not only fry your hair but may also burn your scalp and surrounding skin. For regular usage, it is advisable to use a heat resistant hair serum, as it will put a protective film on your hair. This will result in keeping the moisture intact. Make sure to keep your intended storage space for the dryer in mind while picking the size. If you do not have enough space and opt for a huge hair dryer, you will end up troubling yourself. Also, the size of the hood has a lot to do with its handiness and travel-friendliness. But, whatever you do, make sure that the hood is big enough to easily accommodate your head comfortably. And if you are planning to use rollers and velcros, keep that in mind too while picking the hood size. Always keep a little extra margin than what you have in your mind. The ideal hood size should have sufficient space to easily fit in any sort of roller setting. One of the major reasons people go for hooded hair dryers is because they are faster than the regular dryers. But, of course, you will find a lot of dryers in this category that do not offer an impressive drying time. So, if you end up buying any of such models, it will be a total waste of money and, of course, a total waste of time. Make sure that your chosen dryer has the ability to swiftly dry your hair. The ideal drying time should range between 25-60 minutes in total for all kinds of hair. If your dryer takes more than that, you will get your hair damaged pretty soon. A good thing about many hard hooded dryers is that they usually come with a time-controller. This way you can regulate the timing of heat exposure and won’t end up overheating your hair. Another thing to make sure is to go through and follow all the instructions that come with the dryer. As a general rule, if your hair is of normal thickness and normal texture, your drying time shouldn’t exceed half an hour. On the other hand, if your hair is thick, coarse, and stubborn, an hour’s treatment would be good enough for you. However, for better long term results, it is always best to keep the exposure timing as low as possible. As you saw in our list above, there are dryers that let you adjust the height according to your requirement. Generally, this option is found in the dryers that come with larger stands. This feature is especially important if you have a height problem and regular hooded hair dryers fail to provide you proper coverage. With this option available, you will not have to resort to any uncomfortable ways like sitting on a pillow mound, to fit your head into the dryer’s hood. And how can we forget those painful neck sores? Ouch! Thank God this option is here. Before purchasing anything, people usually try to evaluate the benefits of the product by asking themselves that why they should get it. But, when it comes to a hooded hair dryer, you should ask yourself why you shouldn’t get it. Yes, it has that many benefits. Not only does it make drying your hair a total breeze, but it also delivers salon like results in just a matter of few minutes. And most importantly, it saves you lifetime trips to the salon made specifically for this purpose, and of course the money involved too. Let’s take a look at all the benefits in detail. The biggest benefit of switching to a hooded hair dryer from a handheld one is the quick drying that it provides. The hood completely covers your head from all the sides and it results in providing even heat to all the hair. This ultimately results in quicker hair drying. While using hooded hair dryers, your hands are completely free because all the work is done by the hood itself. This adds to the convenience of its usage and makes it easy for you to take care of other things while your hair is getting dried. And even if you don’t have anything else to do, these hair dryers give you a very relaxing experience. None of your body parts need to do anything while the process is going on. All you have to do is sit back, relax and enjoy the quick and hair drying experience. Alright, you might not agree to this at first, as these hooded hair dryers cost a bit more than the conventional handheld ones. But, if you look at its benefits, in the long run, it is definitely a worthy purchase. How? Well, think of how many times a month you have to go to a salon for professional hair drying? Around twice or so, right? Now sum up all that expense that you spend on it on a monthly and yearly basis. The answer will surely make you regret why you didn’t think of buying it before. Unlike the other conventional hair dryers that can easily burn off your hair, the hooded hair dryers minimize the risk of hair damage as much as possible. How this happens is pretty simple. Since you have to hold the traditional dryers in your hand, you tend to overdry a certain area. This results in frying and, eventually, killing your hair. And it also loses all of its moisture. On the other hand, in hooded hair dryers, your hair gets just the right amount of heat from the right distance, which prevents your hair from getting damaged. As we just mentioned above, the entire hood blows out the same amount of heat from every single angle. This means that heat is evenly dispersed around your hair. So, you do not have to worry about any specific section getting additional heat than required. Whether you just want to achieve the basic purpose or you want to add some styling to your hair, hooded hair dryers are best at both of these. They give you salon like results like no other. And what’s best is that you just have to invest one-time in a good quality hooded hair dryer and you’ll be reaping its benefits for a long time. Surely, you would have made up your mind by now about the one you are going to get. But, whatever you choose, don’t forget to go through all the instructions first and avoid over exposing your hair to the heat. Just make sure of these things and you’ll feel like you have stepped out of a salon every time you use it. If you need something small to carry with you, consider our suggestions for the best small hair dryer for traveling. Next to a hair dryer, a crimping iron is probably the cheapest and most portable way to style your hair further.